The outstanding level of design and craftsmanship continues below deck, where both the owner’s stateroom and guest cabins offer privacy and extravagance in equal measure. Yet, there’s more to this yacht than sublime style. An incredible 1500nm range at 10kts defies any industry norm. With a top speed of approximately 30 knots, guests can experience an exhilarating open-air ride from the flybridge or relax and enjoy the stunning scenery from seating areas both fore and aft. A future great. An instant classic. A standard main deck configuration delivers the usual combination of an aft lounge, an amidships dining area and an enclosed or open galley. When it comes to joinery, the high-gloss-tosatin ratio is about 50:50. All combinations of American walnut are popular with owners, and other options include bleached and yellow oaks, with cherry quite popular in the Asian market. More exotic selections like ebonies, zebranos and bamboos are popping up more often too. 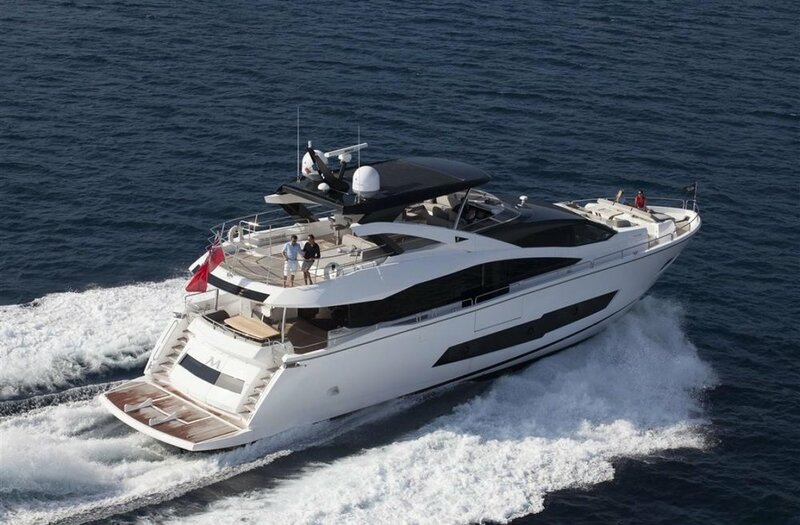 Sunseeker is testing a new stabilization system on the 86 Yacht. Thus far the builder has worked with most mainstream stabilization players such as TRAC, Side-Power Vector Fins and Seakeeper. The first four 86 Yachts will get pairs of Italian company CMC Marine’s 6-foot-6-inch Electra stabilizer fins, which claim a 60 to 65 percent roll reduction. Fuel capacity 11,000 litres 2,907 US gal.